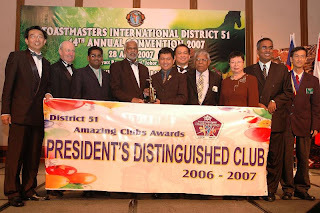 The award was handed over by DTM Azmi to President ATMG Shirl today. ACME (ack-mee) peak. highest degree. e.g., "His business flourished during his 40's because he was at the acme of his performance." The past year has been Extol's anno mirabilis and acme (ding!) of the club's glorious history so far. Despite the crowded room somewhere in USJ, the lack of oxygen and, not to mention, red is light a couple of benighted sentences, the meeting today was raucous. We had 5 guests including 2 little 'uns -- eloquent Sophia and her adorable sister. The acme (ding!) of today's meeting, in my opinion, was the Mother's Day table topics session hosted by DTM Patricia. LF Chan, one of our newly inducted members, gave us a touching tale of his mother who had recently received a bouquet of flowers sent to her by her daughter-in-law. We were reminded that a man (or woman or child) can be hanged and a picture can be hung. But a man (or woman or child) cannot be hung. a) We hung our heads in amazement when we had heard that. b) We hanged our heads in amazement when we had heard that. In any case, CTM Wong PY keynote address was to remind us to chop our heads off (metaphorically speaking). Extol Toastmasters Club Humour Workshop Organizing Chair CC incoming VPPR Marvin Lau. to lead the charges into the first 2 major events as we move on into the new term.